RUSH: This is Ullah in Newbury, North Carolina. Hi, Ullah. Great to have you with us. CALLER: I’ve been a listener for about two years now, and I can’t tell you how much I appreciate your insight, and you’ve really explained things to us. I’ve tried to get my son to listen, but unfortunately that didn’t work out. RUSH: How old is he? CALLER: Not giving up hope. CALLER: He’s 26, yeah, and he’s kind of more of a liberal. RUSH: Does he live in the basement? RUSH: What is his objection to listening or even trying it? CALLER: Well, he really has become a liberal. I mean, he’s still in college. He’s working on an advanced degree. And he just really has taken a more liberal attitude towards things, which has kind of surprised me. RUSH: My deepest condolences. Well, the professors got a hold of him. I mean, you did the best you could. We’re deeply sorry here. It’s terrible. Our condolences. I feel like sending a sympathy card. CALLER: (laughing) Anyway, the reason I called your show was, you know, I’m really surprised that there wasn’t at least one Democrat in either the House or the Senate that came across the aisle to help pass this tax bill. It’s just unreal to me that they are so out of touch with the American people, because you know they’ve got to have people in their districts that would benefit from having more money in their pockets. RUSH: See, you would think that, logically. But no. Democrat voters, for the longest time, have been conditioned to life improving from a government program, not a job. And an increase in benefits. And with the Democrats promising that the enemies of the state will be punished, like corporations, or the rich, or what have you. No, in this case, Ullah, there was not a Democrat who wanted to be alive today who was gonna cross the aisle and vote. The Democrats’ agenda is Trump hatred rooted in Trump not qualified, Trump unfit. There is not a single Democrat that would survive after assisting or siding with anything Trump wants. Chuck and Nancy can do it on a case-by-case basis, but they’re the leaders, you know, and they can claim they’re doing it for deep, dark strategical reasons to screw Trump down the road. But the rank-and-file, the Democrat Party, is united by hatred. They’re the largest hate group in the country. They’re united by deep hatred for Donald Trump. They don’t care about their voters. They really don’t. That’s one of the biggest political myths. Democrats don’t care about the little guy. What the Democrats do is harmful to their voters and the little guy. You look at African-American unemployment. I just saw it. African-American unemployment is at an historical low, after one year of Donald Trump. You know what African-American unemployment was during the eight years of Obama? Try 15% on the U-3 and 28% or 26% on the U-6. They’re two different unemployment categorizations. Well, there are six. The U-3 is what gets reported. That’s the unemployment rate every month, that’s the U-3. U-6 calculates it a different way. But African-American and Hispanic unemployment, historical lows. Democrats can’t claim to have anything to do with it. This has all changed since Trump became president. 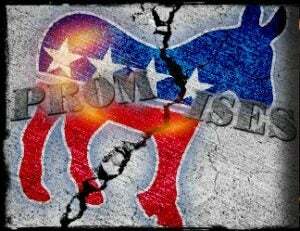 The Democrat Party is a party which pleases its voters by punishing other voters and then promising increased benefits. Remember, everybody in the Democrat Party is a victim of something. They don’t have self-reliance as an objective. They are not responsible for their plight. They’re victims of something. They’re victims of as many plights as the Democrats can invent. Democrats don’t want their voters self-reliant. They don’t want a tax cut being meaningful to their voters. A tax cut to a Democrat voter is nothing more than the government giving money to the rich. The average Democrat voter, when they hear about a tax cut, thinks the government’s gonna take money from them and give it to Bill Gates or Warren Buffett. I’m telling you, the Democrats have so totally distorted the day-to-day worldview of Americanism and humanity that you’d make a huge mistake applying your own logic and reason. You think if the Democrats want to help people at least one of them would vote for the tax cut for people to have more money. No, no, no, no, no, no, no, no. That’s not the route to prosperity. Yourself is not the route to prosperity. Your job is not the route to prosperity. Your identity is. Your victimhood based on your identity is your ticket, as long as the Democrats have the power to punish your oppressors. That’s life as a Democrat today. Here’s Kelly in Ogden, Utah. Great to have you. How are you doing? CALLER: I’m doing good. I want to wish you a Merry Christmas, professor, and to everyone else in the classroom. CALLER: I have been listening to you since August of 1989. So much of what I tell you is gonna sound like you saying it ’cause I’ve learned well I think. CALLER: But I told Mr. Snerdley that two things I really wanted to talk about was, one, the Democrats want to come off today as though they really care about us. We know they don’t because they pushed for, almost in unison, a $1 trillion Porkulus. That money just disappeared out of the economy. And then they pushed for unanimously Obamacare when 75 or so percent of the American public did not want Obamacare, and it didn’t matter. And this has led me to slightly alter the name of that awful party from Democrats to demon rats. That’s the best I can think of them. RUSH: I can see you have experience here as a nearly 28-year listener. Well, I appreciate the call, Kelly. Thank you very much. Appreciate that.